Today is a special night. Today there will be a lunar eclipse, a phenomenon much less common than the solar eclipse. Starting at 9:10 pm tonight , you’ll have to look up at the sky. Because we will live a phenomenon that is lived in very few occasions and that causes the admiration, not only of those who are most fond of the astronomical thing, but also of all those who are curious about what happens beyond the sky. In fact we are facing the second eclipse of the moon that occurs this year 2017 . Tonight will occur just as the Moon comes out and before the sun sets, because both stars will align with the Earth. And our Moon will stain a reddish color. This effect will be extended for a couple of hours, until 23:00 hours. And as the moon goes up, the color will be diluted . After that time, the satellite will appear before our eyes with its normal state. That is, in the grayish tones to which we are accustomed. What will happen to the lunar eclipse tonight? Although in other places of the Earth the lunar eclipse will be much more notorious, from Europe also we will have occasion to see it, although in a more discreet proportions. It is necessary to indicate, yes, that in Africa the Moon will have a deep red color. The citizens of Australia, Asia and Europe will be able to observe it, even in a partial way and following the indications of the experts. As the Sun, the Earth and the Moon align, what happens is that the Moon crosses the shadow projected by the Earth and is seen in the two stars . This is so if the moon is full. In any case, we can see it partially from the eastern half of the peninsula and penumbral if we observe it from the west half. This is explained by color. 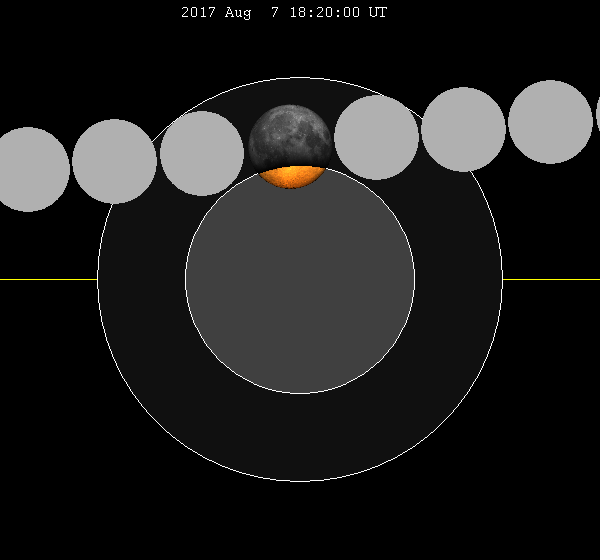 Being partial, the Moon will be reddish. But in other parts of the world, whose intensity will be much higher, the red hue of the Moon will be much more intense. To see the lunar eclipse, it would be convenient for you to do so from a high place. It can be on top of a mountain, on a terrace or anywhere else you are not sunk between buildings. It is that you can see the horizon well , taking into account that the phenomenon will occur from the Moon’s exit through it. You do not have to look for darkness. You know that with the Rain of Perseids or Tears of San Lorenzo (another phenomenon that occurs around August 10), it is best to look for a dark place and possibly be away from light pollution. Something very complicated if you live in a city. In this case, it will not be necessary, because according to experts, the lunar eclipse can be seen equally from an illuminated environment . We must not lose sight of the fact that at 21:10 hours it is still dark. If you reside in the West of Spain or the Canary Islands, chances are you will not be able to enjoy this lunar eclipse . Because experts have reported, this will only be seen in the eastern part of Spain. The astrophysicists are clear: the lunar eclipse that we will see tonight in the sky will not be an impressive Red Moon . Hence they have warned so much about the fact that the moon only has a slightly marronous tone. Nothing else. If you can not go out to see it live, you also have the option to install this application. It is free and does not require an Internet connection. It is called Solar Eclipse Timer and it offers us the possibility of a very technical follow-up of the phenomenon.